Choose Pineapple, or use your favorite fruit. Photo shows blueberry peach. 1. Prep the fruit and preheat oven. Preheat your oven to 350°F. If you are using fresh fruit, be sure it is washed and dried. Slice it into wedges or dice it into large 1" chunks. Most berries can be left whole and smaller stone fruit such as cherries and apricots can be halved. If using frozen fruit, do not defrost. 2. Make the brown sugar glaze. Place your baking pan or skillet on a burner over low heat and add the butter. Once the butter has melted, add the brown sugar and stir it gently. When the brown sugar has melted, turn off the heat, but leave the pan on the stove. 3. Make the cake batter. In the stand mixer, cream the butter and sugar until fluffy. Meanwhile, measure the flour, baking powder and salt in a bowl and whisk gently to combine. Add the eggs one at a time, beating well in between, followed by the vanilla. Add the flour mixture and beat on low speed until just combined, about one minute. 4. Add the fruit to the pan. Arrange the fruit in the baking pan, being sure to crowd the pan as much as possible. The fruit will shrink a little when cooked. If using herbs sprinkle them on top of the fruit. 5. Top with the cake batter. Dollop the fruit with the cake batter, being sure it is evenly distributed. Smooth with a spatula. 6. Bake. Place the cake in the oven. You might want to put it on a baking sheet to catch any overflow (sometimes the fruit bubbles up). Bake for 30 to 40 minutes, or until the top of the cake is golden brown and a thin knife or toothpick inserted in the center comes out clean. 7. Transfer to a cake plate. Remove the cake from the baking sheet and place it on a cooling rack. Let the cake settle for a minute, until any fruit that has leaked up the sides has stopped bubbling. Do not let the cake cool or you will not get it out of the pan! Run a knife around the edges of the cake. Place your cake plate over the cake and, using hot pads, carefully flip the cake over. Gently remove the cake pan. Be careful, as the fruit and glaze is still quite hot and will burn! 8. Re-arrange the fruit and let the cake cool. 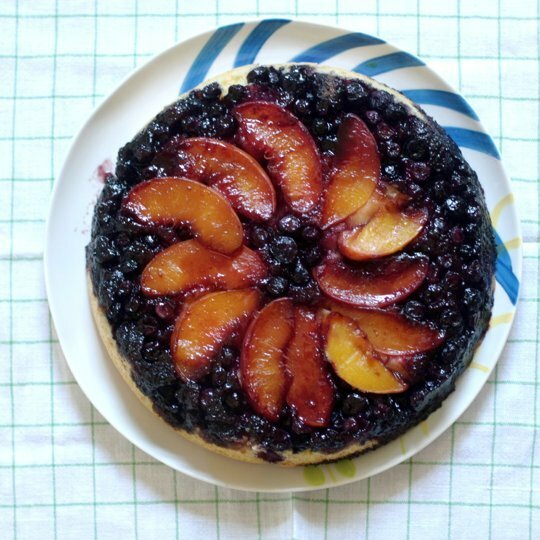 If any pieces of fruit are stuck to the cake pan, gently scrape them up with a knife and replace them on the cake. Let the cake cool. 9. Serve. Serve the cake at room temperature or sightly warm. Optional: top with barely sweetened whipped cream. To store, wrap carefully in plastic wrap or store in an airtight container. Will keep for several days.